Thomas served with the 40th Regiment of Foot, and was killed at the seige of Monte Video in Uruguay, in a covert action by the British against the Spanish supporting a local uprising against Spanish rule. 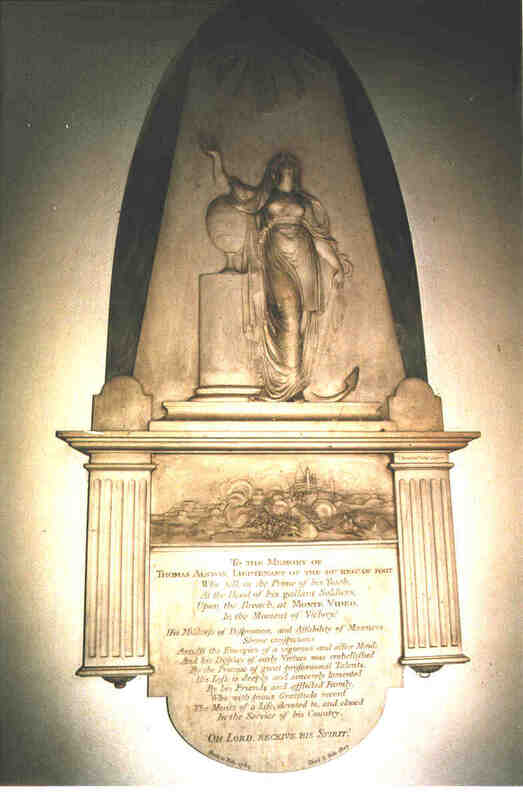 He has a fine sculptured monument by Bacon in Odell Church with exquisite detail illustrating the seige. Ref Rev David Streater Vicar of Odell 2003. LIEUTENANT OF THE 40TH REGT. OF FOOT. In the Moment of Victory. And his display of early Virtues was embellished by the promise of great professional Talents. In the Service of his Country. OH LORD RECEIVE HIS SPIRIT. Born 21 Feb. 1784 Died 3 Feb. 1807."